DeaconChat brings Catholics - both lay and ordained - into dialogue. Three organizations - FutureChurch, the Association of U.S. Catholic Priests, and Voice of the Faithful - launched a new initiative in May 2017 to foster education and conversation on women deacons. DeaconChat brings Catholics - both lay and ordained - into dialogue. On May 12, 2016, Pope Francis, responding to a question posed by members of the International Union of Superiors General (UISG), said that he would establish a commission to study the question of ordaining women deacons in the Roman Catholic Church. That commission was formally announced in August and began its work in November of 2016. FutureChurch has been educating and advocating for the restoration of women deacons for nearly fifteen years. In that time, Catholics from the U.S. and around the world have spoken to their bishops in person and sent over 20,000 postcards and signatures to Rome advancing this cause. One thing is sure: the creation of Pope Francis’s commission is a direct result of grassroots actions by Catholics. In 2013, the Association of U.S. Catholic Priests (AUSCP) called for consideration of ordaining women deacons. Fr. Bob Bonnot, Chair of the AUSCP, believes that as the papal commission continues its work, it is important that Catholics — lay and ordained — undergo their own study and discernment of the history and present possibility of ordaining women to the diaconate. Voice of the Faithful has long advocated for increasing women’s participation in the Church. Their firstpublication on women deacons came out in 2012 at their 10thYear conference. They also awarded their St. Catherine of Siena Layperson Award to Phyllis Zagano for her work on women deacons. 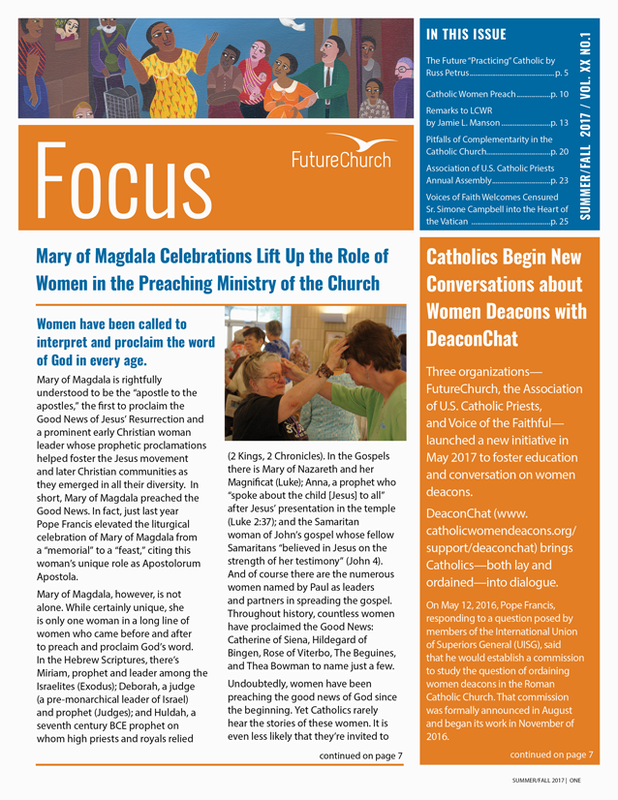 Donna B. Doucette, Executive Director of Voice of the Faithful says DeaconChat is designed to foster educational efforts and to enrich dialogue on women deacons through its three important components: learning, sharing, and connecting. Already, hundreds of Catholics from the United States and around the world are downloading this resource and beginning conversations in their area. Learn more about DeaconChat by going to FutureChurch’s website, CatholicWomenDeacons.org, and downloading these high quality educational materials. You will also find a link to purchase Phyllis Zagano’s book Women Deacons: Past, Present and Future,as well as guides for inviting clergy to dialogue. Thank you for all you do to make the restoration of women deacons a reality in our day!